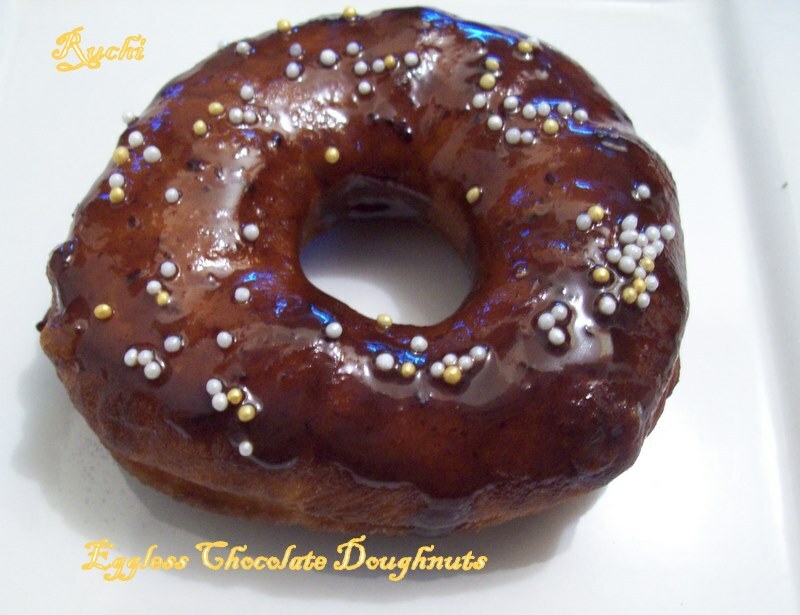 Doughnuts are tasty, inviting and lip-smacking sweet treats. My son likes doughnuts. He asked me to prepare it at home. So I thought this time let me try it at home itself .After many days of pondering about doughnuts finally I tried it. One of the greatest things about this recipe is that they have a mildly sweet, with a soft, fluffy texture. They are surprisingly inexpensive requiring few ordinary household ingredients, we can easily make at home. 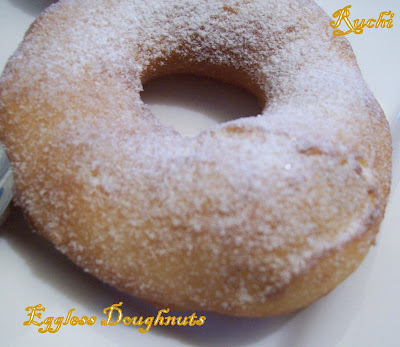 The freshly homemade egg less doughnuts are very tasty and everyone in home loved it. It makes me very happy! 1.Heat the milk in a medium saucepan and heat medium heat just until warm enough to melt the butter. & pour over 1/4 cup sugar & 1/4 cup salted butter. 2.Let cool to room temperature. In a small bowl, sprinkle the yeast over the warm water and let dissolve for 5 minutes and it should get foamy. 3.Add this foamed yeast& 2 cups Maida 1/4tsp salt&1/2 tsp baking powder to milk mixture. Continue adding flour, 1/4 cup at a time, until mixture is a stiff dough, and no longer sticky. 4.Flour is incorporated well after each cup. Slowly mix in the flour until the dough forms a ball. Cover the dough and refrigerate for 30 minutes to 1 hour. Let rise until double in bulk. 5.Roll out on a floured board to 1/2" thick. 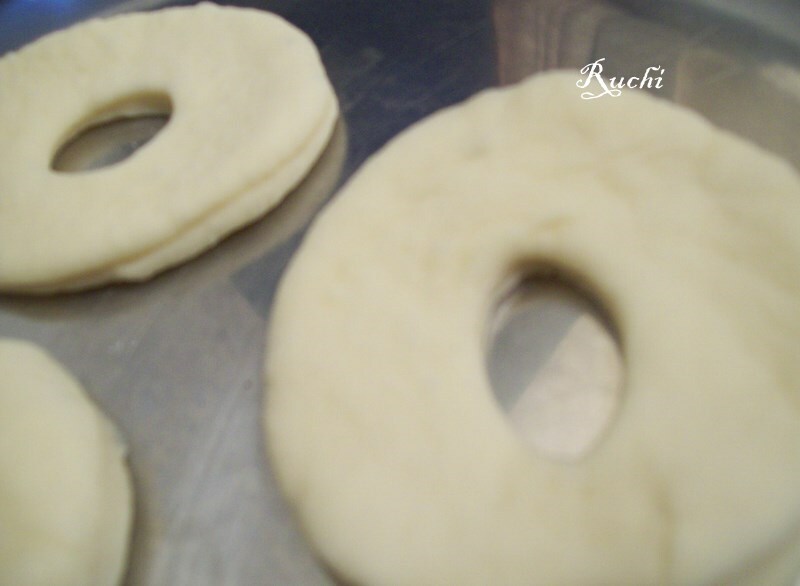 Cut out dough using doughnut cutter or drinking glass and centerthe whole. Set on floured baking sheet, cover lightly with a tea towel, and let rise for10 minutes. 6.Heat your oil for frying in a deep and wide, heavy-bottomed frying pan over medium-high heat. Slide dough slowly into the oil to avoid splattering and deep fry until they puff up and are golden brown. 7.Carefully remove and allow to cool until you can handle them. Then dust the doughnuts with powdered sugar until covered or coat them with melted cooking chocolate. 1.Combine butter, milk, and vanilla in medium saucepan and heat over medium heat until butter is melted. 2.Decrease the heat to low, add the chocolate, and whisk until melted. 3.Turn off heat, add the powdered sugar, and whisk until smooth. 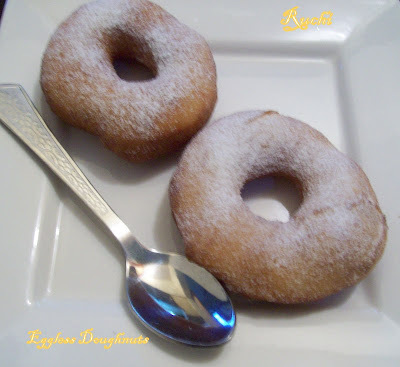 4.Place the mixture over a bowl of warm water and dip the doughnuts immediately. Allow glaze to set for 30 minutes before serving. We love doughnuts at our place too...yours looks amazing! HEY CAN WE BAKE THESE INSTEAD OF FRYING??? Omg, irresistible doughnuts, feel like grabbing and having rite now..
Wow that's looking too yummy and tasty. How r u doing akka? ?